Wow, this is a cracker! This completely sucked me in from the very beginning, made me feel nostalgic about my own adolescence, messed around with my memories, distorting them, then spat me out the other end wondering which my real memories were, and which I’d just allowed to be shaped to fit along with the storyline. If you’re like me, and grew up in the 1990s, loved rock music and lived in Doc Martens then this may be the story for you. I saved up for my first pair of Docs in 1991 when I was just 13 years old (my dad paid half) and I lived in that pair until I was 17, having to buy a new pair as I had worn the previous pair out. Be warned, this is a dark, gritty and twisted story filled with all the complex challenges of being a teenager. If you’re willing to read about alcohol, drugs, sexual experimentation, bullying, insecurities, death, Satanism, and general pushing of boundaries, then I highly recommend this book. 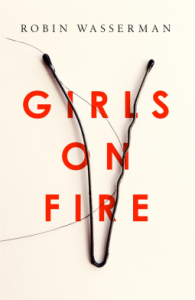 Girls on Fire is an uncomfortably real feeling story (I want to insert ‘experience’ here instead of ‘story’) that I found really hard to put down. I found this story thought provoking and was surprised how much I related to it. It made me realise how lucky I was not to get myself into this much trouble as a teenager, brought back memories of situations that could have ended up much worse, and reminded me of other people and situations I would much rather forget about all over again. I would like to thank the publisher, Little, Brown Book Group for allowing me a copy of this book via NetGalley in exchange for an honest review.